How many of you are familiar with St. Thérèse of Lisieux and the spirituality of her "Little Way"? I've only recently discovered her and want to write a few posts to share and capture what I've been learning. I stumbled onto Thérèse as I've continued thinking about issues I raise in Unclean regarding Christian hospitality. Specifically, I have been thinking a great deal about what it might mean to welcome others in day to day interactions. I've been kicking around descriptions about what it is I'm trying to describe. Sometimes I like the labels "micro-hospitality" or "little hospitality." This practicing of "little hospitality" requires great attention to the present moment (e.g., Am I listening well? Smiling? What is my body language saying? Am I agitated inside?). So sometimes I think of it as "mindfulness hospitality" or "the mindfulness of welcome." Then at other times I'm convinced that the word kindness captures everything I want to say. Obviously, I'm not the first to have pondered such things. And my investigations into this subject eventually led me to the Little Way of Thérèse. Not being Catholic I'd never heard of Thérèse, but I've been really excited to discover her and would like to share with you what I've found. Let's begin with some biography and the influence of the Little Way. Thérèse herself was spiritually precocious and wanted to follow her sisters into the Carmelite community. But she chaffed at having to wait until she was sixteen years of age. She eventually petitioned Pope Leo XIII for a special dispensation to enter the monastery early. 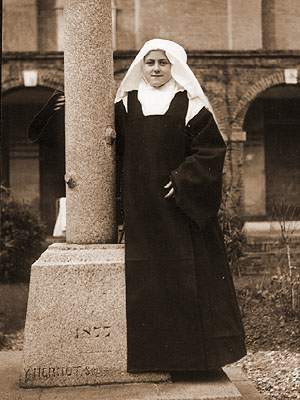 This was granted and on April 9, 1888, at the age of fifteen, Thérèse joined her sisters at Carmel. From all external perspectives Thérèse's years at Carmel were quiet and uneventful. She dutifully participated in the life of the community, but without outward distinction. She loved to write, often composing plays to be put on by the sisters. In the early morning of Good Friday in 1896 Thérèse awoke finding her mouth filled with blood. After a painful and prolonged struggle with tuberculosis for well over a year Thérèse died, after two days of great pain, on September 30, 1897. She was 24. In 1925, a mere twenty-eight years after her death, Pope Pius XI presided over Thérèse's sainthood. Since then Thérèse has become one of the most popular saints. Pius X called Thérèse "the greatest saint of modern times." In 1997 Pope John Paul II named Thérèse a doctor of the church putting her in rarefied air, a saint among the saints, in the company of people like Augustine and Aquinas. Only three women are doctors of the church--Teresa of Avila, Catherine of Siena and Thérèse of Lisieux. When the magisterium proclaims someone a doctor of the Church it intends to point out to all the faithful, particularly to those who perform in the Church the fundamental service of preaching or who undertake the delicate task of theological teaching and research, that the doctrine professed and proclaimed by a certain person can be a reference point, not only because it confirms to the revealed truth but also because it sheds new light on the mysteries of the faith, a deeper understanding of Christ's mystery. John Paul II went on to describe Thérèse as "one of the great masters of the spiritual life in our time." I hope, at this point, your curiosity is piqued. Specifically, I'd like to draw your attention, if you missed it, to the contrast between the quietness of Thérèse's life and the accolades that so quickly followed her death--worldwide devotion, sainthood, and becoming a doctor of the church. No miracles were associated with Thérèse during her life. She never left Carmel. She started no new monastic orders. She did nothing, externally, that drew attention. She was just one nun among other nuns in a cloistered community. And even among her fellow sisters Thérèse's life was unremarkable and lacking in distinction. In fact, when Thérèse died one of her fellow sisters worried that no one would have anything to say at Thérèse's funeral. Never was a saint more unnoticed. More, let's remember that Thérèse died when she was 24. What could such a young person have to say to make her a doctor of the church? The impact of Thérèse rests upon the influence of her spiritual memoir published after her death--Histoire d'une Ame in French, Story of a Soul in English. Story of a Soul was published the year after Thérèse's death in 1898. And much to the surprise of her fellow Carmelite sisters, it went on gain widespread notoriety and influence. During her life few around Thérèse sensed that a spiritual hurricane was raging inside of her. That the quiet and humble exterior was hiding "one of the great masters of the spiritual life in our time." Who knew that spiritual greatness could be so quiet, kind and bland? This is, I think, one of the great attractions of the spirituality and story of Thérèse. The life of Thérèse suggests that sainthood and spiritual genius might be standing right in front of us. Thérèse teaches us that we've become confused about what sainthood looks like. We are picturing something grand and heroic and headline grabbing. But Thérèse teaches us that sainthood can be quiet and nondescript. One of the greatest of saints--even a doctor of the Church on par with Augustine and Aquinas!--can be the person checking you out at WalMart, or the old lady sitting by you at church, or the mom with two toddlers, or the college student, or the janitor taking out the trash in your office. Thomas Merton, who was greatly influenced by Thérèse as were people like Dorothy Day who wrote a biography of Thérèse, noted that one of the things Thérèse accomplished was the "democratization" of holiness. Anyone could be a saint. As John Paul II said of Thérèse, "God has offered the world a precise message [that of Thérèse's] 'Little Way', which everyone can take because everyone is called to holiness." Ponder that. What does sainthood look like? Imagine yourself living with this quiet, undistinctive twenty-year old girl at Carmel, little suspecting that she would become one of the most popular saints in the world today and a doctor of the church. Imagine struggling with what you'd say at her funeral as there didn't seem much to say. What does sainthood look like? In the next post I'll give an overview of the history and content of Story of a Soul. From there we'll get into a description of the Little Way. Oh, I love this already. Quiet obscurity doesn't have to be meaningless. had during any time spent inside a church. eloquently points the way out. Jim's eloquence and logic expose the doctrinal fallacies in Baptist theology. But Baptists don't generally know how Calvinistic they are, because it's never brought out in the open. So glade you have found St Therese. She has been a huge help to me in my life and Im so happy you are studying her "Little Way' I look forward to reading your posts. But it is a battle against Hell if one (like me) has a monstrous ego wanting attention. God's attention is all that is needed and that can be found in seeing that giving is actually receiving. My apologies, but I'm not understanding what you mean, George. My apologies, but I did not communicate well my personal challenge of needing recognition and approval of others. I tend sometimes to become gloomy or passive-aggressive when I don't receive attention according to my self-expectations: in short, I resist the contentment graced to me through the small "deep down things" (as the poet Hopkins put it). Of course, we all need human interaction but sometimes I feed my ego with it in unhealthy ways. I am learning that God does, indeed, watch the sparrow and he watches the small good things I do--and approves. Knowing that God recognizes me is becoming a blessing to me.Blessings to you. Richard, I am so glad you are blogging this series. I am only slightly familiar with St. Therese of Lisieux, I first learned of her when I was researching Mother Teresa, and learned that she took Therese's name. I look forward to reading this series. Ooh, this is so exciting! I'm a Church of Christ expat for High Anglicanism, so yeah... I love the saints.